Roger G. Cook, a former Editor and Technical Director with Good Housekeeping Magazine and Institute, founded the Art Station Studios in 1990 to provide affordable creative space for artists. 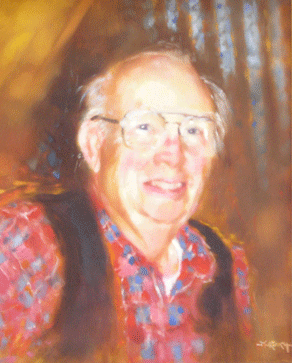 John Scott Murdoch, portrait artist, calls his oil on canvas rendition of Roger Cook “Roger on the Move.” After Roger Cook, founder of Art Station Studios in Highstown, New Jersey passed away September 2007, the resident artists honored Roger by commissioning the portrait. The vibrant picture was not Murdoch’s first. Murdoch was not satisified with his initial portrayal of Roger dressed in a formal suit and tie. He reviewed Cook family photographs and created a new image of Roger in a colorful, flannel shirt on the stairs of the Art Station. In addition to founding Art Station Studios in 1990, Roger Cook created a community of artists who encourage and support each other.